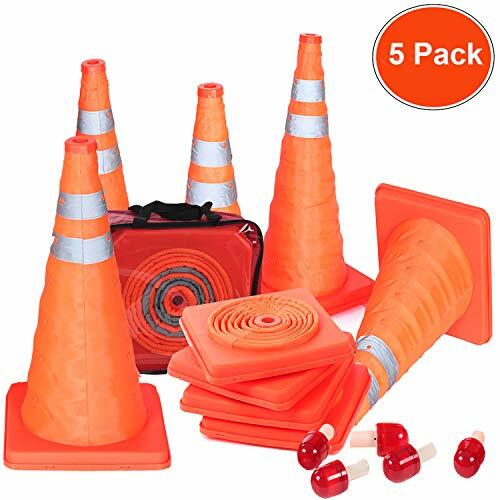 Reliancer collapsible safety traffic cones are design to provide quick and easy setup as well as shipping & storage. They are highly reflective with 5 Flashing reds & steady light and high intensity grade silver reflective bands.Perfect for emergency responders, fire& police enforcement,schools, municipalities, parking Lots, construction, utility trucks, tow trucks road safety, hazard marking and a variety of other applications. Strong ABS material pedestal is heavy enough to stay well in the windy place. 5 pack with a red storage bag for convenient transportation. Storage bag with zipper top and convenient carry straps are made with high quality oxford fabric +PVC film. Reflective bands:Premium grade water-resistant reflective material. 【Collapsible Design&Easy Storage】18 inches in height, can be easily collapses down to 1.4" in height for easy storage.Simply push down on the top to collapse, and pull when ready to use again.5 pack with a red storage bag for convenient transportation.Storage bag with zipper top and convenient carry straps are made with high quality oxford fabric +PVC film. If you have any questions about this product by Reliancer, contact us by completing and submitting the form below. If you are looking for a specif part number, please include it with your message.